Eminem is the best-selling artist of the 2000s in the United States. Throughout his career, he has had 10 number-one albums on the Billboard 200 and five number-one singles on the Billboard Hot 100. With 47.4 million albums sold in the US and 220 million records globally, he is among the world's best-selling artists of all time. Additionally, he is the only artist to have eight albums consecutively debut at number one on the Billboard 200.Rolling Stone ranked him 83rd on its list of 100 Greatest Artists of All Time, calling him the "King of Hip Hop". After his debut album Infinite (1996) and then Slim Shady EP (1997), Eminem signed with Dr. Dre's Aftermath Entertainment and subsequently achieved mainstream popularity in 1999 with The Slim Shady LP, which earned him his first Grammy Award for Best Rap Album. His next two releases, 2000's The Marshall Mathers LP and 2002's The Eminem Show, were worldwide successes, with each being certified diamond in U.S. sales, and both winning Best Rap Album Grammy Awards—making Eminem the first artist to win the award for three consecutive LPs. They were followed by Encore in 2004, another critical and commercial success. Eminem went on hiatus after touring in 2005, releasing Relapse in 2009 and Recovery in 2010. Both won Grammy Awards and Recovery was the best-selling album of 2010 worldwide, the second time he had the international best-selling album of the year (after The Eminem Show). Eminem's eighth album, 2013's The Marshall Mathers LP 2, won two Grammy Awards, including Best Rap Album; it expanded his record for the most wins in that category and his Grammy total to 15.In 2017, he released his ninth studio album, Revival. In addition to his solo career, Eminem is an original member of the Midwest hip hop groups Soul Intent and D12. He is also known for his collaborations with fellow Detroit-based rapper Royce da 5'9"; the two are collectively known as Bad Meets Evil. Eminem has developed other ventures, including Shady Records, with manager Paul Rosenberg, which helped launch the careers of artists such as 50 Cent. Eminem has also established his own channel, Shade 45, on Sirius XM Radio. 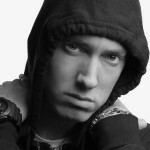 In November 2002, he starred in the hip hop film 8 Mile, which won the Academy Award for Best Original Song, for "Lose Yourself", becoming the first rap artist to ever win the award.Eminem has made cameo appearances in the films The Wash (2001), Funny People (2009), The Interview (2014) and the television series Entourage (2010).